Grand Hyatt Bali Hotel is the crown jewel of resorts in Nusa Dua, the luxury stretch of magnificent beachfront on the island of Bali, offering 636 luxury rooms & suites nested in low-rise Balinese villas, most located in 4 villages. 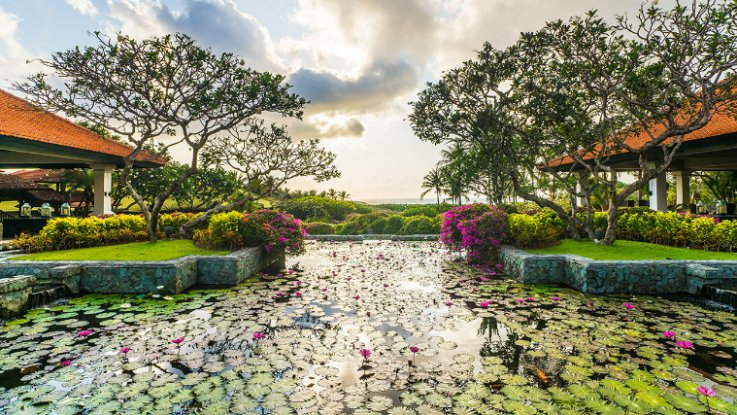 Grand Hyatt Bali resort was conceived as a water palace with lakes, landscape gardens and five lagoon or river pools surrounding low-rise Balinese style buildings. Our Bali resort offers the comfort and luxury services of a world class hotel blended with the relaxing tranquillity of a secluded beach resort. Experience total relaxation at Kriya Spa in Bali designed as an exotic 24-villa water palace amid tropical gardens, with spa treatments focusing on the 4 Balinese healing rituals: harmony, purity, energy and bliss. Play at the 18-hole championship Bali Golf & Country Club 5 minutes away or try the variety of water sports available. Pasar Senggol is the Balinese village and night market of our hotel in Nusa Dua hosting cultural shows, food stalls, a handicraft exhibition and bazaar-style market. The resort is just a short distance from Sanur, Kuta and the city of Denpasar, while Ngurah Rai Airport is only 12 km away. Teakwood and marble from central Java grace the floors of this 49-sqm guestroom furnished with one king bed, daybed and private balcony overlooking tropical gardens or a serene lagoon. Luxurious appointments include marble bath with separate shower, while deluxe amenities include batik robe, slippers, and minibar. Teakwood and marble from central Java grace the floors of this 49-sqm guestroom furnished with one king bed or two twin beds, daybed and private balcony overlooking tropical gardens or a serene lagoon. Luxurious appointments include marble bath with separate shower, while deluxe amenities include batik robe, slippers, complimentary Internet access and Grand Club privileges. One King Bed. Relax amid Balinese ambiance in a 98 square metre room with marble and teak floors, balcony, garden view, and sitting area. The Grand Suite King features a large bathroom and deluxe amenities including high-speed Internet. Connecting room available upon request. Relax amid Balinese ambiance in a 98 square metre room with marble and teak floors, balcony, garden view, and sitting area. The Grand Suite King features a large bathroom and deluxe amenities including high-speed Internet. Connecting room available upon request. This is a standard suite. See World of Hyatt program terms for upgrade eligibility.